Study FIT - Your passport to the future ! The event takes place on September 24th. The program of the subsequent introductory week is available here. Particularly for data collection purposes in Remote Sensing related teaching and research there are now available a small plane (picture below left) and an octocopter (right). Both flying systems can be equipped with different optical and infra red camera systems. 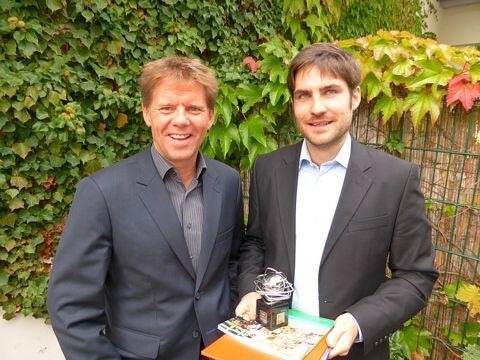 The annual prize of the county savings bank of Barnim ("Sparkasse Barnim") was awarded to FIT graduate Michel Lanz. for his outstanding Master thesis with the title "Automatic Recognition and Analysis of Trees Using Stereo Vision". At the picture below the prize winner (right) is together with the supervisor of the thesis, Prof. Dr. Jan-Peter Mund. The complete software spectrum in the computer pools is updated to the latest versions. To be able to train and practice the diversity of software products especially used at the geo IT market, .Surfer and IDRISI products are now additionally available. In order to improve the hardware und software options for student resaerch projects and the Master research a new computer pool with six graphic workstations, incl. three 3D workstations was established. Computer hard and software are completely updated due to a common programme by the EC (EFRE) and the Federal State of Brandenburg. The newly enrolled 25 students from Cameroon, Germany, Georgia, Iran, Myanmar, Nigeria, Poland and Russia will have excellent conditions for working at the university and individually at home. The FIT study programme is accreditated in Germany by the accreditation agency ASIIN and in Poland by the state accreditation commission PKA. The new academic year has started with FIT students from Cameroon, Germany, Ghana, Poland, Spain and USA. Since the winter semester 2009/2010 a modified curriculum is valid. The module structure and contents were reorganized and updated in order to better meet the educational objectives of the programme and to fulfil the requirements coming from the Bologna process. The new academic year is opened. In the current course there are students from Albania, Cameroon, Germany, India and Poland. 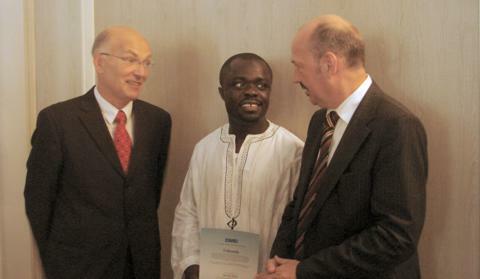 The German Academic Exchange Service (DAAD) Award of 2007 was awarded to M. Sc. Addo Koranteng (Ghana). The topic of his Master Thesis was "Land Use and Land Cover Change in the Kumasi Metropolis and its Environs Based on the Analysis of Landsat Images". At the picture below the prize winner together with the Mayor of Eberswalde Mr. F. Boginski (right) and the Co-Head of the FIT programme Prof. Dr. A. Schultz (left). Another new computer lab with 11 modern graphic workstations equipped with the latest software for data analysis, management and visualization was opened with the begin of the Summer Semester 2007. It serves particularly for the specialized IT courses of the 4th semester. From all working places it is also possible to access a new powerful Linux server. The Linux server will be employed for teaching and training Internet related technologies such as web databases and dynamic web pages. 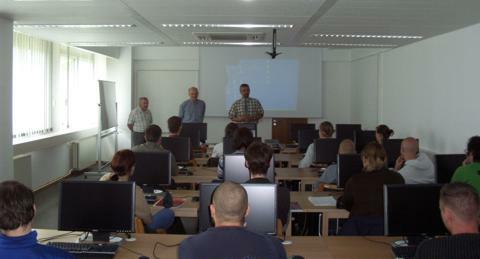 A new computer pool for all study programmes of the Faculty of Forestry was opened by the dean of the faculty Prof. Dr. Harald Schill. 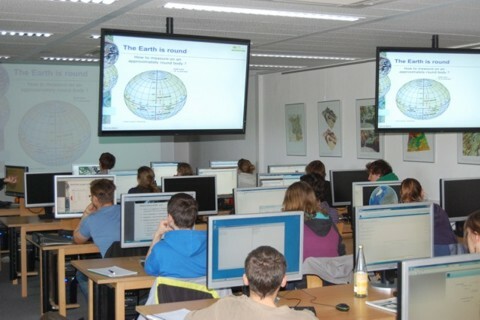 The computer pool contains 24 modern graphic workstations and is equipped with state-of-the-art software for all relevant forest and environment related IT branches (among them ArcGIS, ERDAS Imagine, eCognition, Surfer, various programming enviroments). Especially for FIT students the pool offers excellent working conditions. 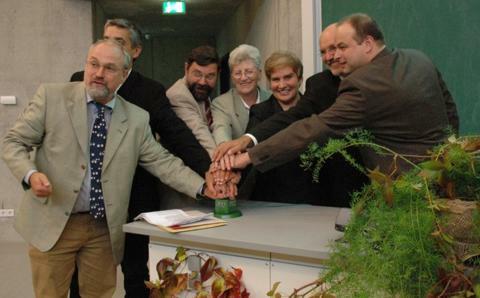 The new International Master Study Programme "Forest Information Technology" was inaugurated by r epresentatives of the Ministry for Rural Development, Environment and Consumer Protection and the Ministry for Science, Research and Culture of the Federal State of Brandenburg, the University of Applied Sciences Eberswalde and the Warsaw Agricultural University. 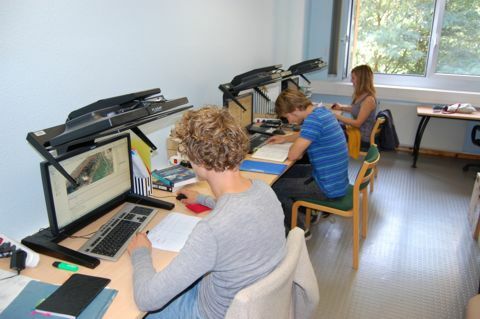 The German Academic Exchange Service (DAAD) Award is the highest award for foreign students in Germany. With this award the DAAD appreciates outstanding study results and an active participation in social life. In 2005 M.Sc. Nabarath Baniya could be awarded for his thesis "The Use of Landsat Thematic Mapper Satellite Image to Monitor Nun Moth (Lymantria monacha) Infestation in Schorfheide Area". 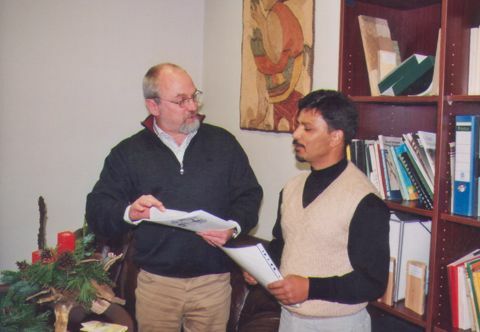 Mr. Baniya will continue his education with a Ph.D. study.